Check out how many calories in Seared Scallops. Get answers to all your nutrition facts questions at FitClick. 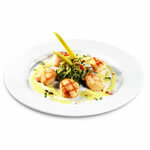 Tip: For nutritional information on all the ingredients in Seared Scallops just click on each ingredient name. Then adjust the serving size for any Seared Scallops ingredient with the serving size tool in the nutrition facts area to the right to see how you can save calories, carbs and more. Sprinkle scallops with salt and pepper. Heat oil in a skillet on medium high until oil is very hot and starts to shimmer. Add scallops to pan, flat side down, and cook for approximately three minutes, or until brown. Turn over, allow other side to brown and remove from pan and allow to rest on paper towels. Find more recipes like Seared Scallops. FitClick has over 60,000 foods and recipes with detailed nutrition information to view.